^ Yaw Owusu, Robert (2005). Kwame Nkrumah's Liberation Thought: A Paradigm for Religious Advocacy in Contemporary Ghana. pp. 97. ^ E. Jessup, John. An Encyclopedic Dictionary of Conflict and Conflict Resolution, 1945-1996. pp. 533. ^ Botwe-Asamoah, Kwame. 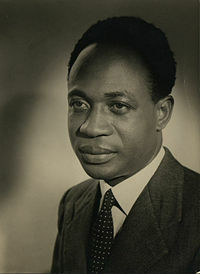 Kwame Nkrumah's Politico-Cultural Thought and Politics: An African-centered Paradigm for the Second Phase of the African Revolution. Page 16. ^ Carl Oglesby and Richard Shaull. Containment and Change. Page 105. ^ Pinkney, Ghana Under Military Rule (1972), pp. 7–8.